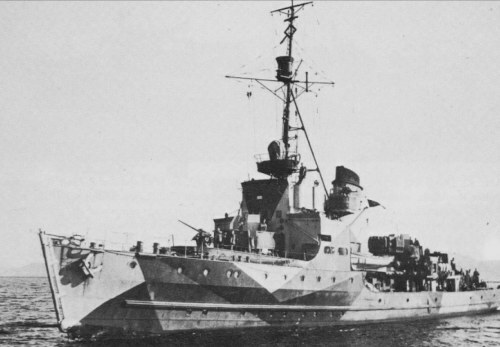 The 1940 type minesweepers reverted to coal-firing due to oil shortage in the German Navy particularly after the invasion of the Soviet Union. The ships of this class were slightly smaller than their predecessors displacing a maximum of just over 770 tons. Twelve of them were fitted with two single torpedo tubes on the forecastle deck for training purposes. They were also less expensive and a total of 131 units were commissioned. Displacement: Standard 640 mt, full load 775 mt. Dimensions: Waterline length 57.6 m, overall length 62.3 m, beam 8.9 m, maximum draft 2.65 m.
Armament: 1 x 10.5cm/L45, 1 x 3.7cm/L83, up to 6 x 2cm. Endurance: 4,000 nm at 10 knots.